The title search shows Bartlett LaBaron conveying the property to Clark Johnson in 1797. The farm was conveyed from Clark Johnson to Jacob Johnson and back to Clark Johnson, who in 1857 conveyed the farm to Joseph Simes. Assessor records indicate that a dwelling, barn, livestock and carriages existed when Johnson owned the farm. Joseph Simes, whose primary residence was elsewhere, is first assessed in 1858 for essentially the same property owned by Johnson. In 1863, assessor records reflect a man of considerable means: dwelling worth $900, barns at $650, shed, corn crib and henery at $125, 20 acres of mowing and tillage, and 80 acres of pasture. Belongings included four horses, two cows, two heifers, five swine, two top buggies, two carry-alls, two horse carts and farm wagons. The records show Simes held stock shares in the Agricultural Branch, Boston & Lowell and Metropolitan Railroads, the Dwight and Lowell Manufacturing Companies, the Suffolk Five Insurance Company, the Lancaster and Lyman Mills, as well as State Bank and Granite Bank. 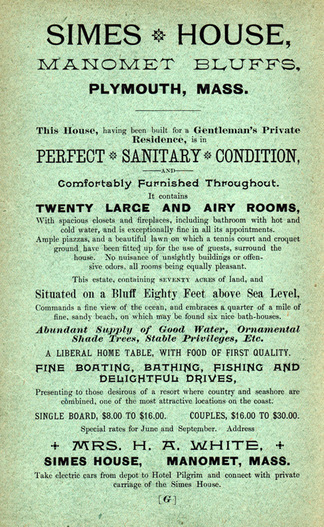 In 1864, the dwelling assessment shows a dwelling worth $9,000. Assuming a year’s lag for assessment, the Simes house and farm as shown in the 1870 photograph by A. H. Locke appears to have been built in 1863. Simes was originally from Portsmouth, NH, then Boston, then Manomet, descended from John Simes, who came to Portsmouth from England in 1736, where the family, of which one member had been mayor of Portsmouth, had always carried a prominent position. Joseph Simes married Mary Johnson, niece of Clark Johnson. They had two children, Emma Cecelia Campion and Charles Campion, the birth children of Marri Anne Gash, who became Louisa and George Simes upon adoption. George Simes married Charlotte Crewe-Read and took title to the farm in 1881. Josephine Simes was born to the couple on Sept. 18, 1885. A plan of the Simes Farm was put to record in 1886. At this time, the farm consisted of 79 acres, running from “Manomet House Road” easterly to the ocean. The farm was conveyed to Edward J. Gladding and then to Frank W. Crocker in 1890. This deed description appears to be the last time the property was conveyed as the farm in its entirety. A subdivision plan was drawn for the South Plymouth Land Company by C. H. Holmes in 1890, showing the Simes House on its own six-acre lot. In 1892, Harriet E. Crocker conveyed to the South Plymouth Land Company. William H. Hawley conveyed the six-acre Simes House lot to George B. Emmons in 1906. Emmons conveyed the house to Abbie L. Punchard in 1907. It was a nursing home known as “Broadview," where Mrs. Wenona Osborne Pinkham of Boston addressed 75 people, including Manomet residents, summer visitors and “Plymouth people” on the necessity of equal suffrage, a natural thing for women to vote, as reported in the Old Colony Memorial, July 8, 1914. Punchard conveyed to George R. Barker in 1918, who conveyed to the Boston’s Young Men’s Christian Union in 1923. The Simes House was operated as a “girls’ camp” for the underprivileged from Boston, Roxbury and Dorchester. It was known as “Esta Naula” until 1939, when its name was changed to “Camp Bazely," reflecting a substantial donation by a Mr. Bazely. The Simes House was held by the BYMCU under “Permanent Trust” until 1954, when it was conveyed to A. Franklin and Agnes H. Trask, who divided the property into 16 lots, two of those now comprising the acre remaining with the house. The title subsequent to Trask has yet to be sufficiently explored. In 1987, a lot line adjustment plan was done to eliminate a property line erroneously passing through the house. The Simes House was taken for taxes in 2009. In 2010, the Simes House Foundation was established to save the house and create a village common.